Alexander McQueen is the king when it comes to serious volume and flair in design (have you seen this jacket? Incredible). Enormous puffy sleeves, oversized bows and extravagant draping are some things you’re likely to see in his collections. I’m all about dramatic details, so when I first came upon this pale blue top with a gorgeous high-low hem and fun bustle, I couldn’t say no. It’s one of those pieces that I’ll have forever and will always bring an exciting element to my outfits, however I style it. The cut is classic enough that I don’t think it’ll ever go out of style, but it still has a little something more than the other tops in my closet. It looks gorgeous with tailored pants and jeans, but here I’ve styled it with my favorite Tibi skirt for a summery, sophisticated look. I’ll definitely be wearing this top all summer long. If you saw any of my Instagrams yesterday, you’ll know I touched down in New York City! I’ll be here for two whole weeks and can’t wait to catch up with friends, meet with some of my favorite designers and brands, and take in the city. I’m even going to spend a day exploring Brooklyn! Click here to follow along with my travels! Love every single bit of this look! Gorgeous! Love this look, powder blue suits you so well. So in love with these soft colors and the detail on that skirt is fantastic! What a gorgeous look! And you look stunning, per usual. Love this look – you can never go wrong with McQueen! Have soooo much fun in NYC! so gorgeous! That top looks like it was made for you…perfect!! So feminine and summery, and refreshing. I love this outfit! The cut and color of the top is great and I love that skirt! I hope you are having a great time in NYC! Absolutely in love with the details of the skirt and the absolutely gorgeous top!! Stunning from all sides..
You look beautiful in this outfit- love the lace! Oh this top is so so so pretty! Love the hi-low look! I love the shape and color of your top. It fits you like a glove. 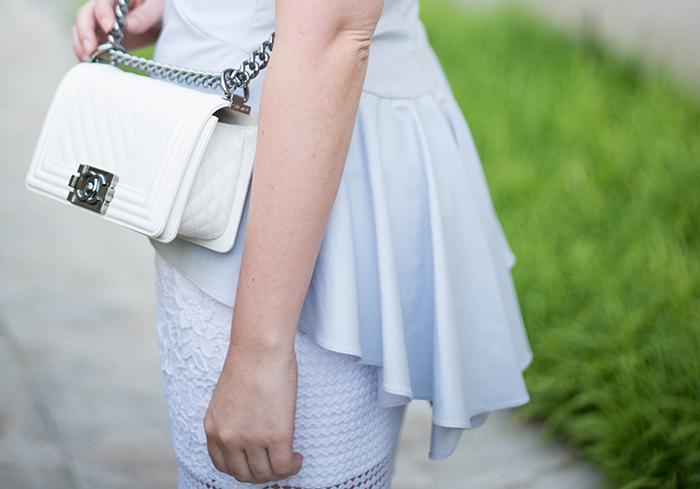 Your white Chanel bag is the perfect accessory! Love your total white look! Amazing !!! NYC for two whole weeks! Well I’m jealous! Have so much fun and I can’t wait to see outfit posts from there! That skirt is gorgeous… love the shoes too. the detail on that top is incredible!! LOVE the details on both the top and the skirt! Such a pretty color too! so pretty love the powder blue and white! What a stunning look. Love that skirt! When it comes to clothes, I’m all about the drama, and this top has drama aplenty. Love it, Merritt! P.S. Have a safe and wonderful trip! I’ll definitely be living vicariously through you on Instagram. This tibi skirt was on one of my wish lists, so pretty! Truly a perfect spring look!!! Your McQueen top is amazing!!! You look stunning!!! PS: I’m still eyeing those PS heels!! Too good!! You know…I have never been a fan of the hi-lo look, especially in skirts, but I absolutely LOVE this look! Of course, leave it to McQueen to make it just perfect. Such a beautiful, feminine look Merritt. I love it all!! What a great top!! The back looks amazing:-) Perfect combo!! Such a beautiful top! I love that skirt with it. The pale blue color is perfection! You look amazing! Especially loving those Proenza sandals… This is the most perfect look. Definitely one of my favorites! Love this outfit! So fantastic! I am super jealous you are in NYC! Have so much fun! Super duper jealous of your Chanel handbag! The white shade is so unique and refreshing!